While it may not feel like it yet, summer is at an end and cooler weather is on the way. To celebrate the last few days of warmth, I’m contemplating knocking up a batch of my favourite summer dessert – white chocolate pannacotta with champagne granita (borrowed from Gordon Ramsay’s Sunday Lunch). First, make the granita. Put the sugar, 250ml water, the liquid glucose and lemon juice into a heavy-based pan and stir over a low heat until the sugar has dissolved. Increase the heat to high and let the sugar syrup bubble for 3 minutes. Leave to cool completely before adding the champagne. Pour the mixture into a shallow plastic container and freeze for 2-3 hours until partially frozen. Scrape the semi-frozen granita with a fork and stir up the ice crystals. Return to freezer until ready to use. To make the pannacotta, put the cream, milk and sugar into a heavy-based saucepan over a low heat to melt the sugar, stirring occasionally. Meanwhile, soak the gelatine sheets in a shallow dish of cold water for a few minutes. When the cream begins to bubble up the sides of the pan, remove from the heat. Stir in the white chocolate and continue to stir until it has melted. Squeeze the excess water from the gelatine leaves, add them to the warm mixture and stir well to dissolve. Pour the mixture into 6-8 moulds. Stand the moulds on a tray and refrigerate for 5-6 hours or overnight until set. 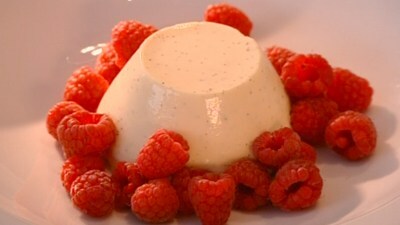 The pannacotta should still have a slight wobble when it is ready. To turn out, dip the base of each mould in a bowl of hot water for two seconds, the invert onto a small place and give the mould a shake to release the pannacotta. Serve each pannacotta surrounded by raspberries and shavings of champagne granita. Top with a curl of lemon zest. What better way to say farewell to summer? Bon Appetit!